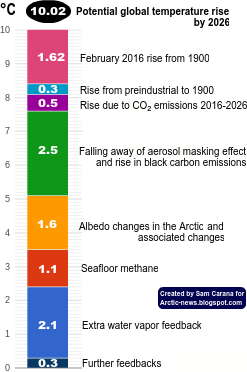 Arctic News: Which Trend Is Best? NASA just released temperature data for February 2017. Should we be worried? Yes, there are many reasons to be very worried. We may suddenly face a future in which many if not most people will have little or no access to food, water, medicines, electricity and shelter, while diseases go rampant and gangs and warlords loot and devastate the few livable areas left. Human beings as a species will face the risk of total extinction, particularly if many species of animals and plants that humans depend on will disappear. The post continues: Many people are still in denial about the severity of the problem of global warming, the accumulation of dangers and their progression. Indeed, even today many people will still deny that such events could strike suddenly, e.g. within a few years time. Many people use linear trends to predict the future many years from now. As an example, the straight blue line on the graph below is a linear trend based on NASA 1880-current meteorological stations data. The problem is that linear trends, especially when based on data that go back many years, can make people overlook important recent changes such as the temperature rise that has taken place over the past few years, the decline of glaciers and sea ice and the recent increases in concentrations of carbon dioxide in the atmosphere. An alternative approach is to use recent data, e.g., from the year 2012, and then calculate a polynomial trend that extends a few years into the future. 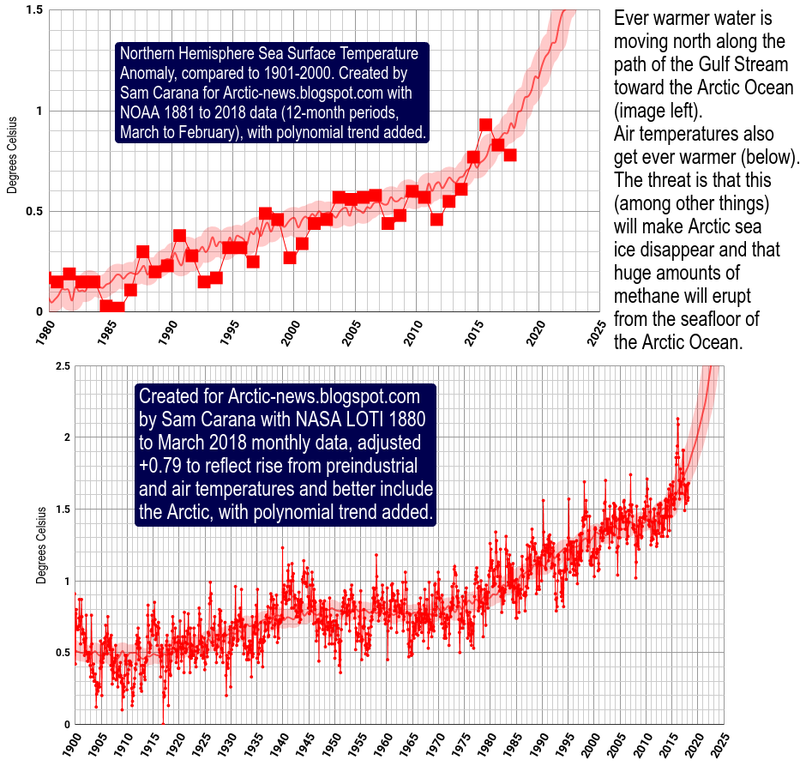 Taking such an approach can result in a polynomial trend (red curved line) that is contained in the NASA Land+Ocean data from January 2012 to February 2017. This trend shows the potential for a 10°C (18°F) rise four years from now, and this should act as a powerful warning. The appropriateness of linear versus non-linear trends was also discussed earlier at the Controversy page. In addition to looking at trends that are contained in such data, it makes sense to analyse the different elements contributing to such a rise. Such elements are discussed in more detail at the extinction page, which confirms the potential for a 10°C temperature rise within years, i.e. by the year 2026.